They’re in the food you eat and you can even buy them in bottles for days when you’re eating on the run and might not be eating nutrient-rich foods. Vitamins are compounds your body needs for a variety of chemical processes that are essential to life. Your body can’t make these compounds, or at least not make enough to meet your body’s requirements. Deficiency in a vitamin or vitamins creates an imbalance that when severe enough can lead to death. Vitamin deficiencies have been with us throughout history. For example, the first recorded case of scurvy, due to vitamin C deficiency, dates back to 150 B.C. We’re a lot wiser about health and nutrition these days, but a number of myths about vitamins still prevail. Let’s look at a few of them. You might see a multivitamin as a cheap insurance policy, a way to get nutritional support when you’re eating on the run. However, getting your vitamins through multivitamins often isn’t as good as getting them from food sources. When you get vitamins from food, they’re combined with other components inherent to that food. In some cases, these components are synergistic, meaning they work better together than in isolation. Vitamin supplements are isolated from the natural package that nature provides them with. For example, when you take a vitamin supplement, you don’t get the phytonutrients and fiber that goes along with the plant. You’re getting vitamins in their most isolated form and such isolated components don’t always work the same way in your body. Plus, studies show that supplements, depending on how they’re made, don’t always dissolve properly after taking them. If so, you may get little or no benefit from the vitamins you take. Still, supplemental vitamins have their place. If you have a known vitamin deficiency, you may need a supplement to help you get your levels back up. If absorption is an issue, you may need a sublingual form (one that you place under your tongue rather than swallow). For example, some older people have problems absorbing vitamin B12. To bypass the digestive tract, they need sublingual or injectable vitamin B12. So, vitamin supplements can be helpful for people who are deficient, have absorption issues, or who are at high risk of deficiency. Yet, we should all aim for getting vitamins from whole foods when possible. 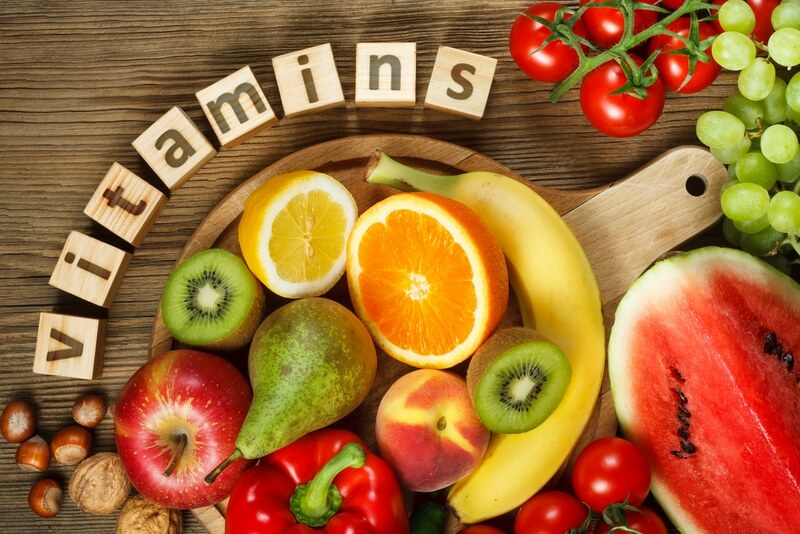 When researchers have looked at supplementing with a particular vitamin or vitamin, the results often are different than expected. For example, vitamin E is believed to play a role in preventing heart disease but getting vitamin E in supplement form doesn’t seem to offer the same protection as getting it through diet. One reason may be that there are eight isomers of vitamin E that differ in structure. The average vitamin E supplement only has one or a few of these isomers. Another example. We know that beta-carotene that you get from orange fruits and vegetables is healthful. Beta-carotene has anti-inflammatory and antioxidant benefits and is important for visual health. Yet, in a study where researchers gave smokers a daily dose of beta-carotene for four years to, hopefully, lower their risk of lung cancer, the rate of lung cancer actually increased! Most of the higher risk was in female smokers for reasons that are unknown. In fact, taking a multivitamin, based on some studies may actually be harmful. A study published in the Archives of Internal Medicine found that older women who took a multivitamin or mineral supplement had a higher risk of mortality, particularly with supplements that contained iron. Have you heard someone say they need a multivitamin because they feel tired? If you’re not deficient in a particular vitamin, a multivitamin won’t cure your fatigue. It’s true that some vitamins, particularly B-vitamins, are involved in energy metabolism and if you’re deficient you may feel tired. But taking B-vitamins in hopes of generating more energy to power up your day won’t work unless you’re already deficient. Deficiencies of some micronutrients other than B-vitamins can also cause fatigue, including iron and vitamin D. However, it’s important not to blindly treat fatigue with a multivitamin. See your doc and get your levels of these vitamins, as well as an iron panel, checked. Also, make sure you don’t have another cause for fatigue, such as an under-active thyroid. Consumer Lab is an independent testing firm and they frequently test vitamins and supplements, including ones from leading manufacturers. They often find discrepancies between what the manufacturer lists and what’s in the product. In fact, they reported finding discrepancies in around 30% of the products they tested. In some cases, there’s less of a particular ingredient. In others, there’s more than what’s listed. Even more concerning are contaminants like heavy metals, including lead, in the vitamins people swallow on a daily basis. If you must take a vitamin or supplement, look for one that’s certified by an independent testing firm, like Pharmacopeia (USP) or Consumer Lab. This gives you additional assurance that you’re getting what’s on the label. Vitamins can either be water-soluble or fat-soluble. Vitamins A, D, E, and K are fat-soluble, meaning your body can store them. In fact, it’s the liver’s job to store fat-soluble vitamins. But, if you take high doses of one of these vitamins, you can overwhelm your liver’s ability to stockpile it. Vitamin A, for example, can be toxic if you take it above the recommended intake for a period of time. If you develop vitamin A toxicity, you can experience bone pain, visual changes, and liver damage. Of course, you won’t develop toxicity by taking one multivitamin a day, assuming the vitamin is formulated properly, but you could develop problems if you take a multivitamin in combination with other fat-soluble vitamins that your body stores. Unless you eat polar bear liver, an extremely rich source of vitamin A, you probably won’t develop vitamin A toxicity through diet alone. More isn’t always better when it comes to vitamins – and it’s best to get them naturally from dietary sources, as long as you eat a balanced diet and have no health problems that affect your ability to absorb them. So, don’t automatically reach for a pill to improve your health – choose more nutrient-rich foods instead.